These spirits are helping to revitalize classic cocktails and create new ones. It is becoming more and more a thing of the past: Ordering a glass of a sweet liqueur to sip alongside coffee after dinner. Certainly, restaurant diners will still call for some Sambuca, complete with three coffee beans, or a snifter of Drambuie, or Amaretto Disarronno, to enjoy with their espresso; and dinner party hosts still proudly bring out an array of liqueurs to give their guests as much fun, as much choice, as possible. But most people tend to call for a Cognac, Armagnac, single malt Scotch, fine Bourbon, or perhaps a great añejo Tequila, if they’re looking for a postprandial potion. Adapted from a recipe by Juan Coronado, Sortie Restaurant, New York City. Fill a cocktail shaker two-thirds full of ice and add all of the ingredients. Stir for approximately 30 seconds, and strain into a chilled cocktail glass. Add garnish. Adapted from a recipe by David Nepove, Enrico’s Bar & Restaurant, San Francisco. Put the mint leaves into an empty mixing glass and grind them with a wooden muddler until the essence of the mint leaves has been extracted. Fill the mixing glass (not the metal cocktail shaker) two-thirds full of ice, add the liqueur and lemon juice, and shake for 15 seconds. Strain into an ice-filled collins glass, top with club soda and add the garnish. Adapted from a recipe by Jacques Bezuidenhout, Harry Denton’s Starlight Room, San Francisco. Pour the Chartreuse into a brandy snifter, and by tilting the glass and rotating it, coat the entire interior of the glass with the liqueur. Discard excess liqueur. Carefully flame the interior of the glass with a match, allow it to burn for a few seconds, then extinguish the flame by placing a saucer on top of the glass. Add the remaining ingredients to the snifter, stir briefly to mix, and serve. Adapted from a recipe by Christopher "Stretch" Gerdon, China Grill, Miami Beach. Fill a cocktail shaker two-thirds full of ice and add all of the ingredients. Shake for approximately 15 seconds, and strain into a chilled cocktail glass. Add the garnish. Adapted from a recipe by Tony Venci, La Femme Bar, MGM Grand Hotel, Las Vegas. Adapted from a recipe in Cocktail: The Drinks Bible for the 21st Century (Viking, 1998), by Paul Harrington and Laura Moorhead. Fill a cocktail shaker two-thirds full of ice and add all of the ingredients. Shake for 15 seconds, and strain into a chilled cocktail glass. Add the garnish. Recipe from Painter’s, Cornwall-on-Hudson, New York. Fill a cocktail shaker two-thirds full of ice and add all of the ingredients. Shake for approximately 15 seconds, and strain into a chilled cocktail glass. Adapted from a recipe by Chef Kathy Casey, Kathy Casey Food Studios, Seattle. Fill a cocktail shaker two-thirds full of ice and add all of the ingredients. Shake for approximately 15 seconds, and strain into a chilled cocktail glass rimmed with sugar. Add the garnish. So why do new liqueurs seem to be hitting the liquor store shelves every time we turn our heads? Because they are indispensable to professional bartenders and home mixologists. And cocktails, you must have noticed, are most definitely in vogue. Three categories of classic cocktails—families of drinks that I call Duos, Trios and International Sours—rely on liqueurs to add a little sweetness and lots of personality to a wide variety of drinks. For instance, the Black Russian, a simple mixture of vodka and Kahlúa, is part of the Duo family—it’s made with two ingredients. The vodka cuts the sweetness of the Kahlúa, and it’s possible to alter the intensity of the drink by differing the ratios of the ingredients. Add Baileys Irish Cream liqueur to a Black Russian, and you’ve made yourself a Mudslide, a member of the Trio family. Drinks in the International Sour family call for a base spirit, citrus juice and a liqueur. The citrus juice adds a mouth-puckering tartness to the cocktail, and the liqueur balances the sour factor with a little sweetness. The Bistro Sidecar, created by Chef Kathy Casey at Kathy Casey Food Studios in Seattle, is a great example of an International Sour. Using brandy as a base, she calls for both lemon and tangerine juices for tartness, then sweetens the deal with Tuaca, an Italian liqueur flavored with vanilla and citrus, and Frangelico, another Italian masterpiece, this one rich with the essence of hazelnuts. There are, of course, many variations on the International Sour theme. Take, for instance, La Grand Feu, a drink served at La Femme Bar in the MGM Grand Hotel in Las Vegas. Hennessy Cognac is the base of the cocktail, and it’s sweetened by two liqueurs—Navan, a sophisticated Cognac-based liqueur flavored with vanilla beans, and Baileys Irish Cream. But instead of adding a citrus juice to balance the drink, Bartender Tony Venci, who created the recipe, calls for a tad of spicy Chai tea. Now think about what you could do with this drink to make it your own. Instead of reaching for the Baileys, substitute Amarula Cream liqueur; flavored with marula fruit from Africa, it would add some rich fruity notes. Or, instead of the Navan, perhaps you’d like to use some Chocoviac, a Cognac-based liqueur flavored with chocolate as well as vanilla. Adding chocolate to the mix could prove very interesting. Or, if you prefer coffee over chocolate, try some Kahlúa Especial (a new, intense bottling of the perennial favorite), a dash of Tia Maria, Starbucks coffee liqueur, or Illy Espresso liqueur, instead. There are, of course, some liqueurs for which there can be no substitute. Chartreuse and Bénédictine are intense, complex, herbal potions have been around for hundreds of years, and they know no rivals. About as close as you will come is Elisir M. P. Roux, a new-ish herbal liqueur made with star anise and a host of botanicals—marjoram, hyssop, fennel, cinnamon, nutmeg, balm, coriander, bitter almond, garden balsam, wild angelica, lemon peel, ginseng and damiana. Though it is also an herbal product, and made in the style of the older mainstays in this category, the predominance of star anise in this bottling makes it a liqueur unto itself. To the best of my knowledge there’s only one liqueur on the market that’s flavored with green tea: Zen Green Tea Liqueur by name, and subtle by nature, this product is very worthy of experimentation. Juan Coronado, co-owner of Sortie, a New York City hot spot, uses it to make Sortie’s Green Tea Martini; he simply marries the liqueur to Charbay Green Tea Vodka, a delectable spirit, shakes it over ice, and serves it in a martini glass, garnished with a shiso leaf. Another new eastern-themed liqueur is SOHO Lychee Liqueur, which is so intensely sweet it should be used sparingly in cocktails lest it take over the drink. David Nepove, bartender at Enrico’s in San Francisco, makes a wonderfully refreshing tall drink called the Sun Salutation with SOHO. He muddles fresh mint leaves, adds fresh lemon juice, SOHO, ice and club soda, and finishes the drink with a garnish of fresh berries in season, and a sprig of mint. The Sun Salutation is a great quaff to slake your thirst. One of the most intriguing liqueurs on the market is Nostalgie Black Walnut Liqueur. It’s made at the Charbay distillery, in Napa Valley, where they soak black, English and Carpathian walnuts in their own artisinal brandy for two years before adding a secret blend of herbs and spices. Jacques Bezuidenhout, bartender at Harry Denton’s Starlight Lounge in San Francisco, uses this delicacy to make a drink he calls The Angel’s Share. You will need a couple of C-notes to enjoy Bezuidenhout’s creation because he uses Remy-Martin Louis XIII Cognac and Porto Rocha 20-year Tawny to make the drink. And the glass in which it’s served is first rinsed with V.E.P. Chartreuse—a fine, extra-aged version of this venerable liqueur—which is flamed before the drink is poured. "[Nostalgie] is a delicious liqueur with dark, sweet walnut flavors," says Bezuidenhout, "and the V.E.P. Chartreuse is wonderfully herbal and rich." Some cocktails demand specific liqueurs. The cosmopolitan, for instance, must contain a great triple sec if you want to serve a sophisticated version of this classic. Cointreau is the way to go with this one. It’s the driest triple sec on the market, and it adds a wonderful peppery quality to the drink as well as sublime bitter and sweet orange notes. To make a delicious variation on the Cosmo, though, you might want to follow in the footsteps of bartender Christopher "Stretch" Gerdon, who holds forth at the bar at China Grill in Miami Beach. Instead of using the traditional citrus-flavored vodka as a base for this drink, Gerdon calls for Wokka Saki, a blend of vodka and sake that’s flavored with delicious Asian fruits. And while we’re looking at orange-flavored liqueurs, I should point out a new drink created by Phillip Ward, bartender at Manhattan’s newest and hottest cocktail bar, Pegu Club, on West Houston Street. Using Grand Marnier, the lush, Cognac-based orange-flavored liqueur from France, as a sweetening agent, Ward assembled a drink he calls The Londoner by combining it with gin, sweet vermouth and orange bitters. The orange flavors play really well off the spicy botanicals in the gin. Martin Douderoff, a cocktail fanatic from Manhattan, recently introduced me to a drink called the Nicky Finn that’s detailed in Cocktail: The Drinks Bible for the 21st Century, by Paul Harrington and Laura Moorhead. It’s basically a Sidecar—Cognac, Cointreau and lemon juice—that’s spiked with a dash of Pernod, the wonderful French anise-flavored liqueur. Once again I was shown how just a tiny amount of a good liqueur can alter the profile of a cocktail. The Nicky Finn is a sublime quaff. Another variation on a classic that’s been selling incredibly well at my local bar, Painter’s, in Cornwall-on-Hudson, New York, is the Hpnotiq Margarita. 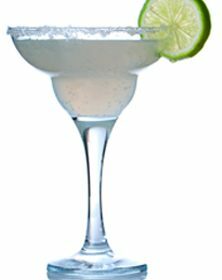 I pull an occasional shift at Painter’s, and when a customer recently asked me for a margarita, "but make it a little different, would you?" I reached for the bottle of Hpnotiq, the Cognac/vodka-based aquamarine liqueur that’s flavored with tropical fruits, and used it alongside the Cointreau, in equal amounts, when I made the drink. It wasn’t long before half the customers at the bar had ordered bright blue Hpnotiq margaritas. A bar with a goodly crowd of regulars in a small village—and many of them have blue drinks in front of them. Picture that, if you please, the next time you visit your local liquor store. Liqueurs should be at the top of your list if you’re planning on making great cocktails in 2006.